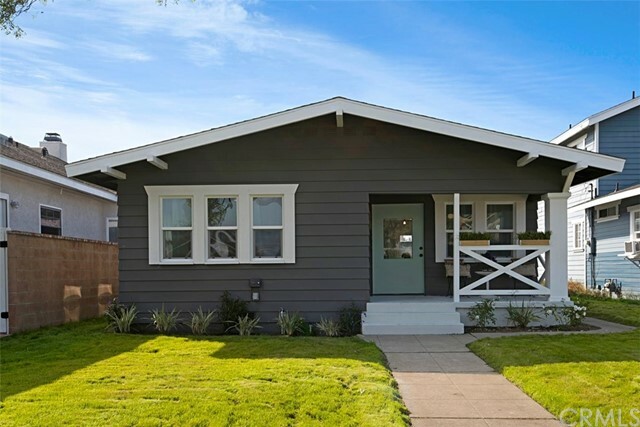 Fabulous Craftsman style bungalow, completely remodeled home with a wonderful open floor plan in one of the most desirable family neighborhoods in Torrance. Beautifully appointed throughout with every attention to detail. Located in this trendy Old Torrance neighborhood, this gem boast a 5100 sq foot lot, an entertainers dream! Boasting 3 bedrooms and 2 bathrooms, this bungalow is complimented by picturesque front porch overlooking a large yard. The kitchen has been newly remodeled with white shaker cabinets, quartz counters, stainless appliances, & subway tile backsplash. The master bedroom is light and bright with a barn door leading to the master bath featuring custom tile and large seamless glass shower. The secondary bedrooms are light and bright. 7-inch baseboards, Craftsman style molding, gray tone designer flooring, new lighting and fresh paint compliment this exceptional home. Copper plumbing throughout and upgraded electrical panel. The detached garage is coupled with a craft/laundry room complete with Shiplap siding. This lot is zoned for multi-units, providing you with a multitude of expansion options for consideration. Great location close to shops and Charles H. Wilson Park. Race to see this beautiful home and make it your own!